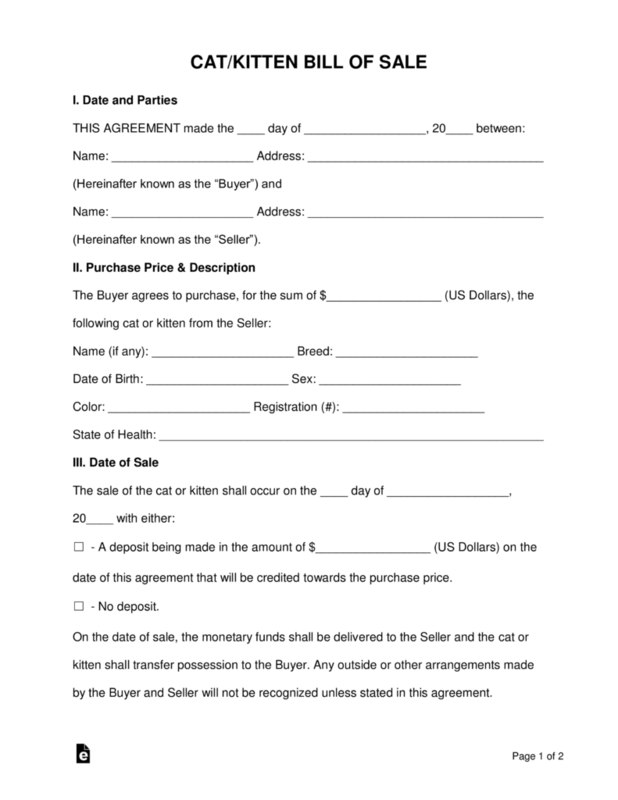 The cat/kitten bill of sale is used for the purchase of a cat or kitten and is considered to be a receipt that proves the purchase from an individual or a breeder. 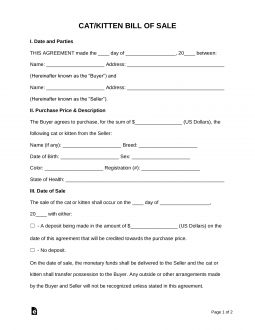 The form is generally present at the time monies are presented to the seller for the purchase of the animal. Once the animal has been purchased, the former owner is no longer liable for any further expenses. This document will require the witness of a state licensed notary public. Most kittens are eligible to be sold between 8-12 weeks depending upon whether or not it’s still consuming mother’s milk as the primary source of nutrition. When Do You Use a Cat/Kitten Bill of Sale? Why Is a Cat/Kitten Bill of Sale Necessary? The Cat/Kitten Bill of Sale is necessary to make any sale legal and binding between the seller and the buyer. It sets the terms of agreements, describes the cat for sale in detail, stipulates the purchase price and records the buyer and seller’s personal information. Essentially, it’s a receipt that helps protects both parties from potential fraud, misunderstandings, or complications during the sale. It is a determining document for proof of ownership, which is important when a buyer pays for a kitten that isn’t ready to leave its mother yet. How to Sell My Cat? Take note of the cat’s breed, age, DOB (if known), vaccinations, whether it’s been spayed or neutered, health conditions, and anything else a new owner would need to know. If the cat is a specific breed, make sure to see how much similar cats are typically sold for in your area. Be sure to contact relatives and friends to let them know you have a cat or kittens for sale. Then put up ads on social media pages, the newspaper, fliers and community boards. Once you get a few buyers, have them come see the cat in person (or the parents if the kitten isn’t born yet). Ask them some simple screening questions like why they want the cat and what the home environment is like. It’s also a good idea to do a home check for extra peace of mind. This will help give you confidence that you’re selling your feline friend to a caring and loving home. Once the bill of sale is complete and money exchanged, the form will need to be signed by a public notary to officiate the sale. Then the sale is finalized and complete.